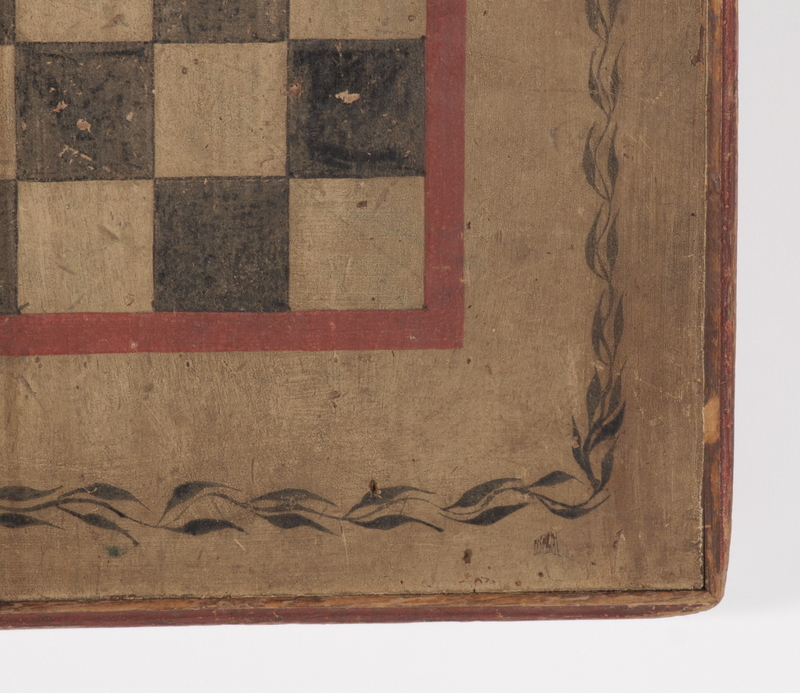 Hands-down, the best of the Fox & Geese game board that I have ever encountered, with an incorporated Mill game, in untouched red, ochre white, and blue paint. The dry, untouched, and in all ways exceptional surface and graphics are outstanding. 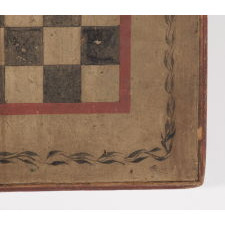 Typically the game Fox & Geese appears on the reverse of American Parcheesi and checkerboards as almost an afterthought, with far greater emphasis on colors and imagery focused upon the whichever game appears on the other side. 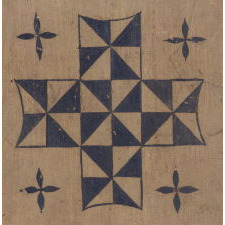 Also sometimes referred to as Hi Q, the grid for this design very often appears as just linear lines that divide five squares into triangular sections by making a cross of St. George (perpendicular) overlaid with the cross of St. Andrew (diagonal). These five squares are set in a large, perpendicular cross formation. The lines are often one color and the background another. Sometimes a bit more effort is put forth for decorative purposes, but seldom is anything like this encountered. 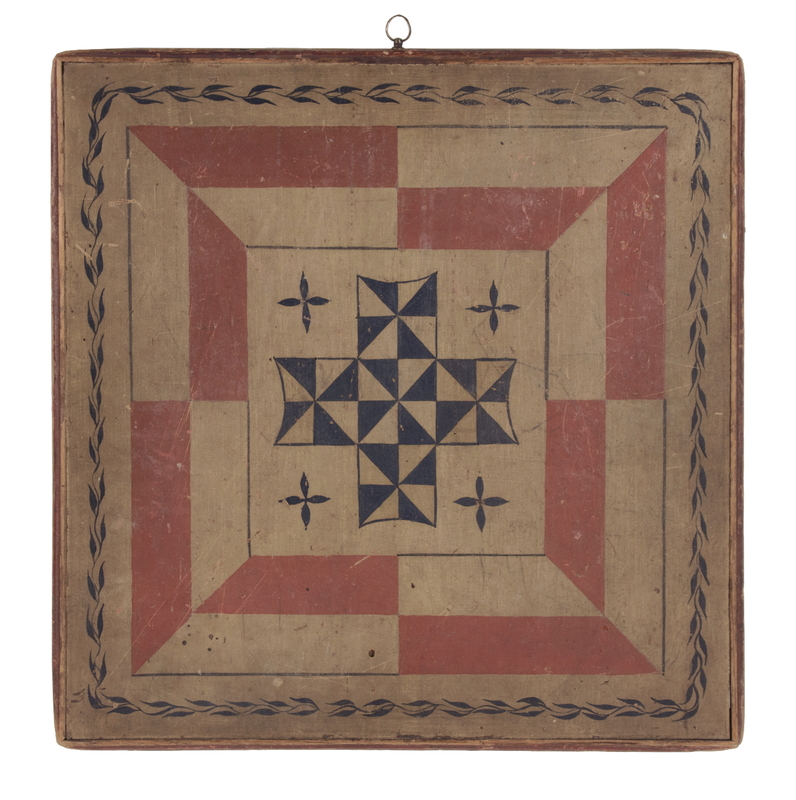 Here the Fox & Geese grid is transformed into something that looks more like a pinwheel or windmill quilt pattern, simply by filling in every other space with solid blue. 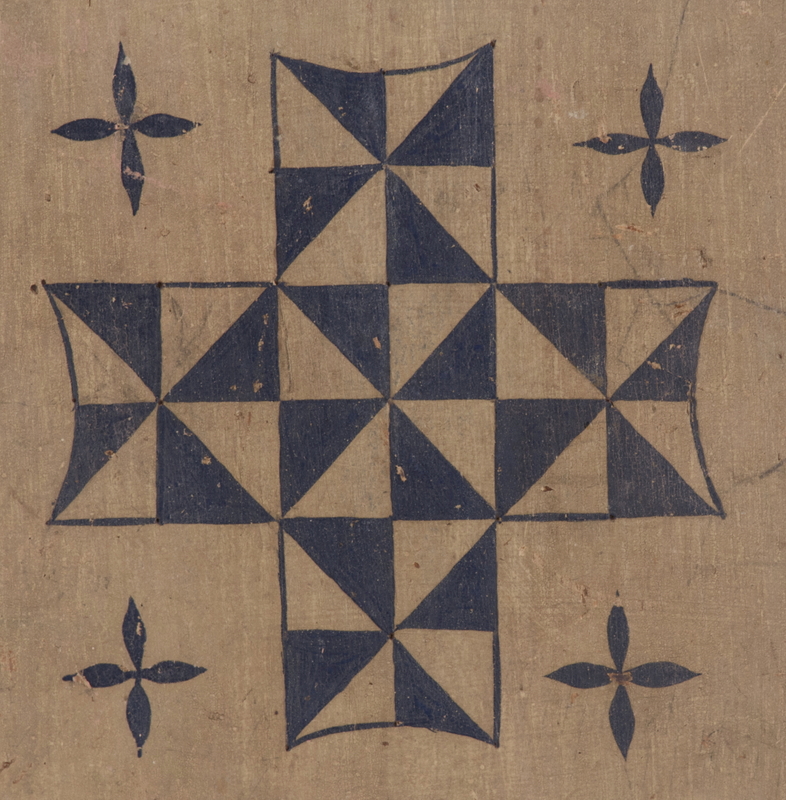 Note how the ends of each arm of the cross are concave instead of straight, which alters its typical appearance. The open areas between each arm are flanked by four-pointed pinwheels or flowers, also in blue. Beyond this is another game. Called a Mill game, the graphics of this are altered from their general appearance by filling in alternating trapezoids with salmon red, in a manner similar to what was done in the Fox & Geese section. In both cases the change seems a simple one, but I can't remember seeing one painted in this fashion. 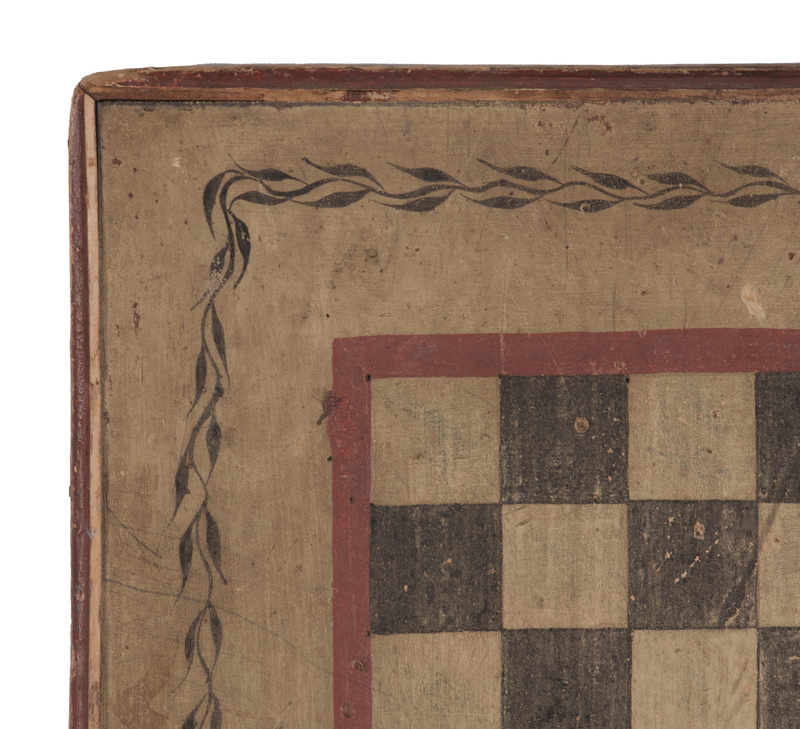 The Mill game serves a decorative function, as well as a practical one, by acting as a modernistic, geometric border with excellent graphic qualities. Beyond this is a true border of delicate blue vines with willow-like leaves. The overall result is exceptional, especially for such an early example. 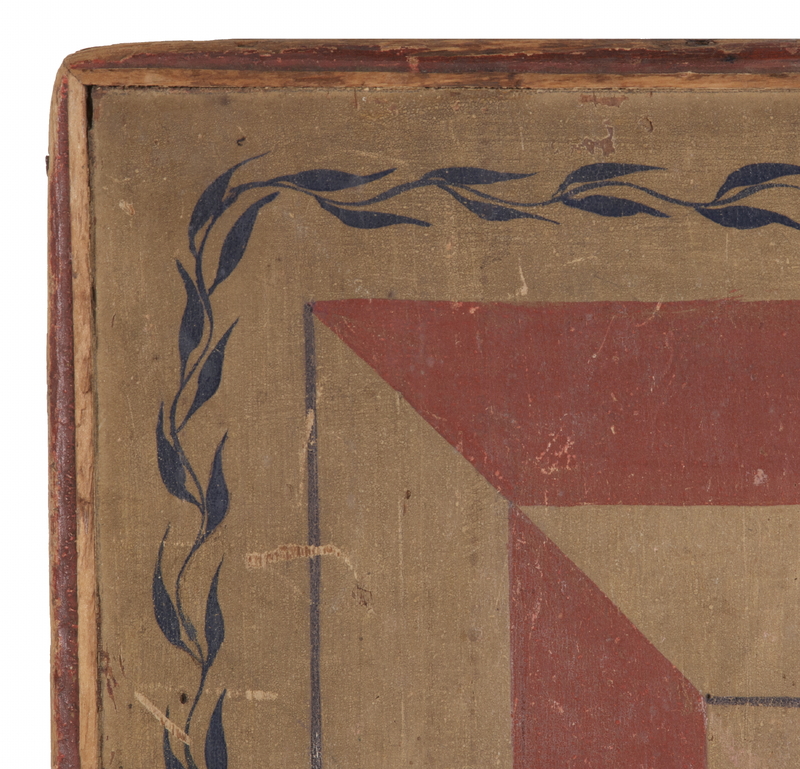 The colors are muted enough to appeal to collectors of 18th and early 19th century Americana, but strong enough and with good enough graphics to be called a masterpiece of American folk art in general. The reverse of the board is also nice, though not as unusual or colorful and with slightly more wear. 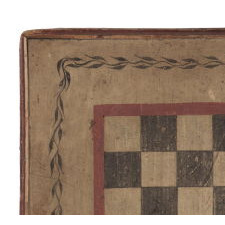 This is checkers, with a black grid against the ochre white ground, a salmon red border, and the same vine border, except in black instead of blue. The board is constructed of a single, softwood plank, slightly over 19 inches wide, with a nicely shaped, applied, molded edge. There is a period brass ring for hanging. 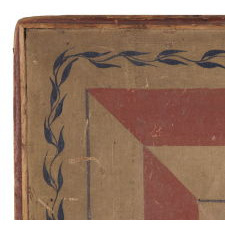 Provenance: In the private collection of dealer David Good for 25 years. Condition: Minor wear and soiling with respect to age and use, and slightly more so on the reverse.